Old School Loose Ball bearing truck.Each threaded truck to assemble loose ball wheels on. 62mm x 42mm profile 95A. 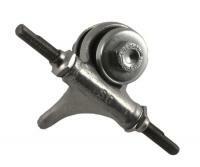 from the skate experts at Sure Grip. Sized for superior balance and speed.8-packs only. Machined in Southern California. 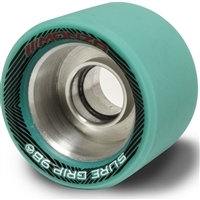 Monza Speed wheels Teal 62mm X 42mm 98aA. 62mm x 42mm profile 98A. from the skate experts at Sure Grip. Sized for superior balance and speed.8-packs only. Machined in Southern California. Backspin Remix Skate Wheels. The Backspin Remix is here! Super grippy and super fast with a high quality POLYCARBONATE hub. Sure-Grip Fo-Mac Harmony roller skate wheels 57mm are like the regular Premier Fomac wheels except black and white instead of brown. Limited edition. Fo-Mac only made in USA. Roller Bones Team Roller Skate Wheels 57mm x 30mm, 101a , Black, Purple, Green, Pink and White.